Preheat the oven to 350°F. Spray the inside of a tube or bundt pan with nonstick spray; set aside. In a large mixing bowl, beat the butter and sugar on medium speed until well blended. Add the pumpkin and eggs and mix thoroughly. In a medium bowl, combine the flour, baking powder, cinnamon, ginger, nutmeg, cloves and salt. Add the flour mixture to the pumpkin mixture. Mix on medium speed until combined. Pour the batter into the prepared pan. Prepare the streusel topping: In a small bowl combine the flour, sugars, cinnamon, melted butter and walnuts. Sprinkle the streusel over the cake batter. Bake for 50-55 minutes or until a toothpick comes out clean. Cool on a wire rack for about 15 minutes. Slide a knife around the pan so the cake doesn’t stick when removing it. Invert the cake onto a plate. Then invert the cake onto another plate, so that the streusel is on the top. Cool completely. Cover and store at room temperature. I also added a brown butter icing~why not right? In a small saucepan, heat the butter over medium heat until it turns a golden brown. Whisk in the sugar and add cream, one tablespoon at a time until you have pourable icing. Drizzle over cooled cake. Recipe from make ahead meals for busy moms, found here. This will be going in Cooking on Crystal Lake second edition! If it continues to rain here, I may just make this, read and watch movies while eating..a whole cake! Who knows? This looks incredibly delicious. I'm trying it for a family brunch this weekend. Can't wait to taste it! One question: Does it freeze well? I'd like to make a few days before and freeze. smells great........in the oven now!! I was going to make pumpkin pie, but decided to try out the coffee cake instead! Looks delicious! Planning on making it for thanksgiving this weekend. Quick question...could I substitute the spices with all-spice? So I obviously found your recipe years after everyone else but better late than never. 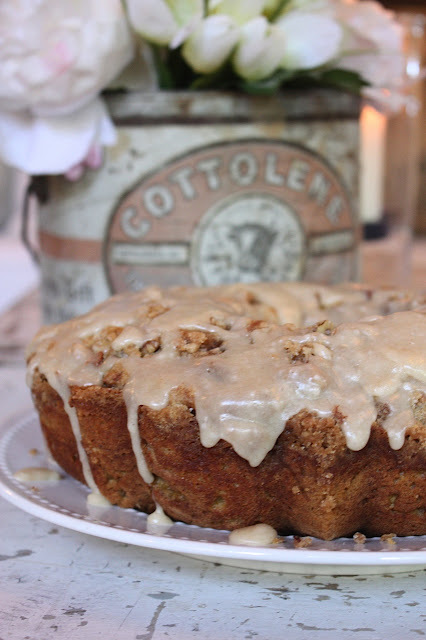 I was cruising through Pinterest looking for a new coffee cake when I came across yours. I figured it was meant to be because I had all of the ingredients and I was born in Savannah many, many years ago. 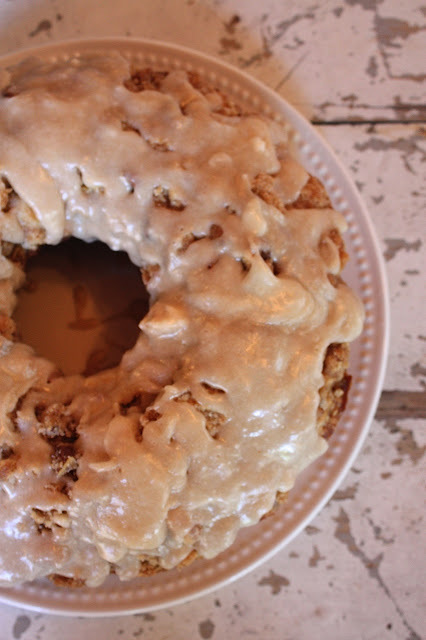 This coffee cake is so delicious and received rave reviews. Thanks for posting it, even though it was years ago!